Azul, or as I think of it ‘Starburst: The Board Game’ is a tightly designed little monster of passive aggressive tile-laying. It’s extraordinarily good, and easily deserving of our four-and-a-half star review. There are few games that give you so many options while simultaneously ensuring all those options are viable. If a good game is marked by how many interesting decisions you make, and it is at least in part, Azul is a very good game indeed. Is it a game that is accessible though? That remains to be seen. Let’s get our tiles and our grouting and see what we can make stick to the sides of this teardown. Colour blindness isn’t a problem at all in the vast majority of cases. Those for whom monochromacy may be an issue will have problems with the blue and the red opal fruits but everything else is distinguished by a pattern as well as a colour. I’m not sure the motivation for blue and red being unadorned with patterns – it’s a bit of a shame. While monochromacy is a very rare condition, this is still a case where a game that could have been totally accessible in this category falls a little short. Many people, ourselves included, have drawn comparisons between Azul and Sagrada and nowhere is that a more profitable endeavor than in this category. 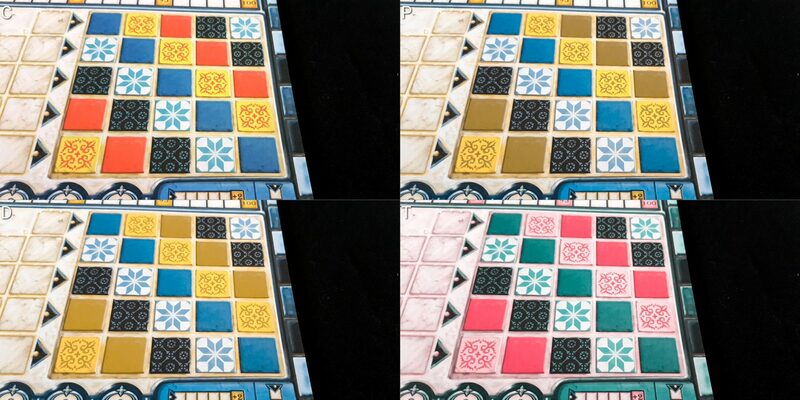 Sagrada presents numerous problems for colour blind players of all stripes. Azul presents problems to a much, much smaller group of potential players. It could have been better, but if you want a ‘Sagrada flavoured’ game you can likely play then Azul is by far your best bet. We strongly recommend Azul in this category, with a small demerit because of the fact it’s not completely colour blind accessible in all circumstances. There’s a mix of good and bad here. 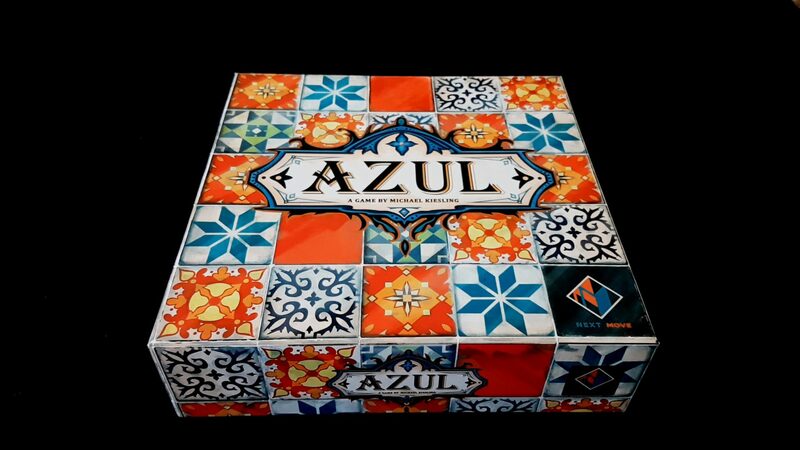 The good news is that Azul is a very tactile game and that extends to elements of game state. Players will know by touch how many tiles are on the pattern lines and the rows progress in a linear order so it’s equally easy to tell how many should be there. 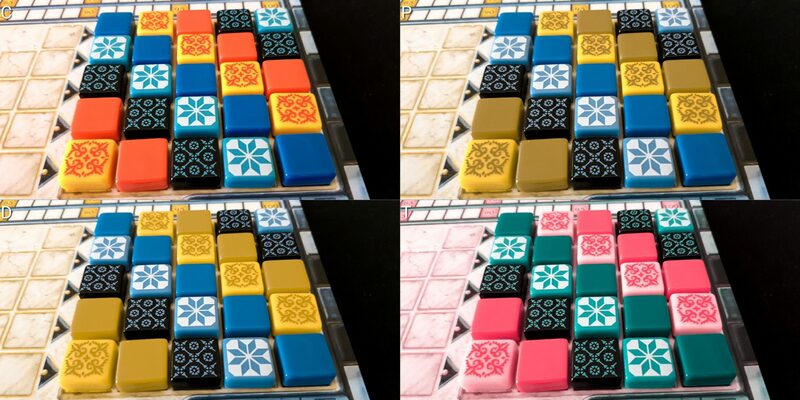 Players will be able to tell how many tiles they’ve placed in a row and work out adjacency effects by touch. That’s a considerable amount of the game state that is available through feel alone and that’s great. Even the pattern of the wall has a fixed, repeating order and so the contents of a placed row can be deduced even if they can’t be seen. The problem is that not all of the game can be explored with touch because individual Starburst are differentiated only by colour and pattern. For those for whom some degree of visual discrimination is possible that might not be a problem. There are a fixed number of factory offerings that need to be considered and the solution space of play contracts tightly as players take turns. There’s quite a lot of visual information involved in selecting tiles, but the tiles are also reasonably visually distinctive. There’s no time limit involved and no real risk of leaking gameplay intention if close inspection is necessary. However, to play Azul well you’re also going to need a good idea of what other people are doing and aiming for. Sometimes your best move in Azul is to leave someone with a terrible choice. To do that, you need to know what they can and cannot place in their pattern lines. That in turn needs cross-referenced against the factory offerings and your own board. That then needs assessed against how you’re going to change the balance of power when you make a selection – if it’s from a factory display all the non-selected tiles go into the centre and that can be good or bad for the next player. Careful play is going to need a player to know when they’re helping or hindering the next person along. Deeper play is going to involve knowing how they react is going to influence the player two along from you. Sometimes, that player will even be you. For those for whom total blindness is an issue, much of the game becomes largely a memory puzzle – not of your own board, which can be physically assessed and deduced – but rather of the boards of other players in combination with the opportunities in the factories and central areas. A lot of that is verbalizable since everyone shares a board pattern (unless playing the more open variant) but it’s still going to put a fair bit of cognitive pressure on players given how mistakes and missed opportunities can come back to haunt you. Verbalisation doesn’t give quite the same sweep of information as a visual inspection would permit. That said, with a supportive table and perhaps some assistive aids and compensations we believe Azul is likely to be broadly playable in this category regardless of extent of visual impairment. We’ll recommend, just, Azul in this category. The rules are simple, but the decisions you take in Azul are hugely impactful. It’s not about simply placing tiles on the wall but where and in what order. A well-placed tile might earn you ten points for its placement. A poorly placed tile of the same colour might earn you one. You also need to be playing with an eye to column, row and set bonuses and those sometimes need players to take a short-term hit in order to cement an end game advantage. 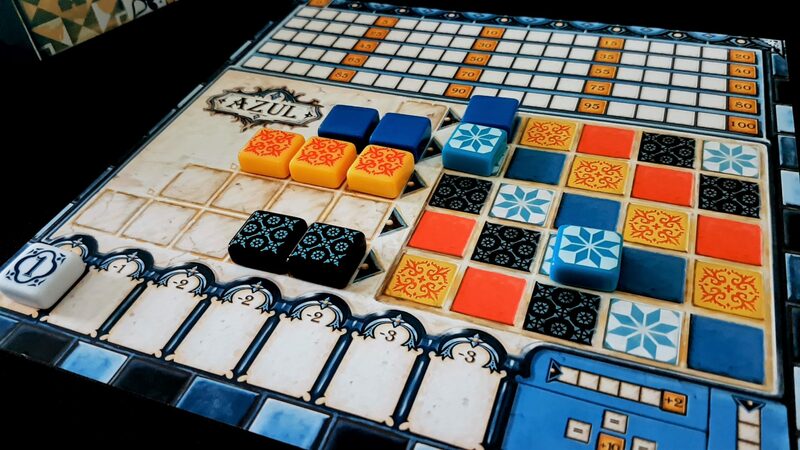 In Azul it’s about when you grab tiles – you want to grab them when the cost to you is lowest and the cost to your opponent is highest. While the required level of numeracy isn’t any more sophisticated than arithmetic there’s quite a lot of it in subtle ways. Knowledge of probability too is important because of the way tiles are drawn and discarded – tiles that don’t go on a wall are placed in the box until such time as there are no more tiles in the bag to draw. As such, the chance of the needed tiles appearing might go down and up and down again over the course of the game. Admittedly I haven’t actually had a game where that’s been necessary yet. That will influence whether or not it’s a good idea to take tiles when they appear and the extent to which you should be willing to take a point penalty to do so. All of these are profoundly numerate activities even if that numeracy is often implicit. The game doesn’t have any requirement for literacy though – it’s really only a set of tiles and a set of patterns. Similarly, while the game state in Azul is never complicated it is often complex and rich with implication. You might want to pick up two of the strawberry Starburst, but which factory display you take them from matters hugely. That might be the difference between screwing your opponent over and handing them a dream opportunity. Azul also benefits from forward thinking because at some point you’re going to have to get into the mindset of mini-maxing the converging opportunities. You might decide to take a single tile one turn because it leaves your opponent with a big set they have to take as penalties. 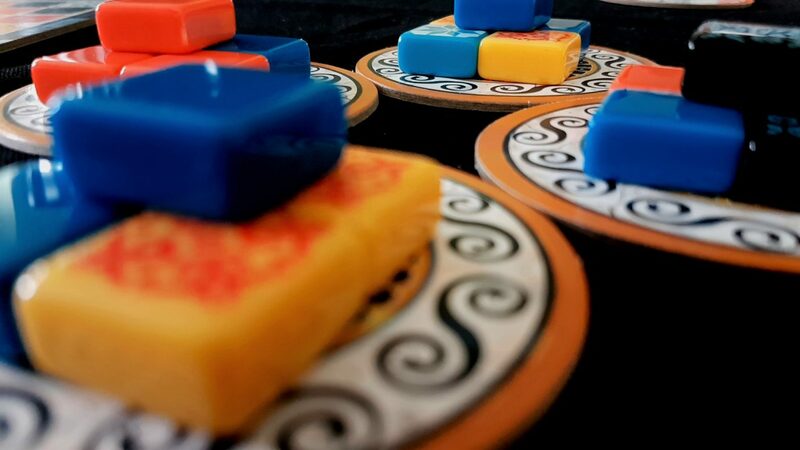 There’s a curve of strategic play in Azul that gradually results in you shifting your attention and focus from your own board to that of your opponents with all the attendant additional cognitive cost. I wonder though if there’s not an interesting co-operative variant you could house-rule – it seems like the mechanism of the central offering would be just as interesting if you were looking to maximise a shared score as it would be if you were looking to minimise the score of an opponent. The act of building the wall of your board is inherently satisfying and primarily the cognitive cost, as is often the case, is bound up in a context of intense competition. I haven’t tested this variant, but I’d be interested to know if anyone does. 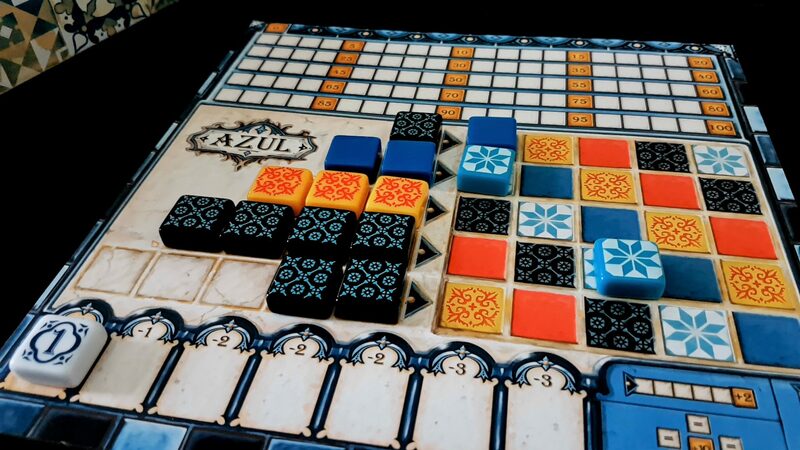 Azul puts very little emphasis on memory – the only real hidden information is in the bag from which you draw tiles. Even the contents of that can be deduced from what’s in the box and what’s on the board. There are only five different kinds of tiles, so a quick check around the table will give a fair approximation of the contents left to be drawn. You can even explicitly count these out if you like because you use all the tiles in every game. Nothing gets burned or discarded at the start. Scoring is based on how many tiles there are in the row and column where you place a tile, and this is relatively easily handled – you can do it by touch if needed. Touch each tile connected to yours, including that new one, in a row. Each is a point. Touch each tile connected to yours in a column. Each is a point. Add those up on the score track. Rows, columns and sets are all predictable in terms of their point bonuses – the easier they are to make, the fewer points they give you. In any case the end of game scoring is shown directly on the board. With all this in mind, we can’t recommend Azul for those with fluid intelligence concerns. The accessible variant we discussed above is hypothetical, but we’d certainly be willing to soften our grade here if it turns out to be fun. Let us know in the comments if you give it a go! We’ll recommend Azul for those with memory considerations because there is very little in the game that requires active memorisation. While the only direct competition is over tiles, there is a lot of aggression in Azul. So much of what you do is in terms of the relative calculation of advantage – you’re not necessarily trying to increase your score. What you’re trying to do is increase the difference between your score and that of your opponents. You can do that in two ways – score highly or force an opponent to take penalties. That’s always a problematic system in this category because our psychology is towards being loss averse. We feel losses more intensely than we feel gains, and that’s especially true when a loss is down to the explicit and intentional actions of another player. In Azul I might take a one-point penalty in order to force you to take a six point penalty. In relative terms, I just gained five points but it feels like you lost twelve. It’s a troublesome mechanic. Azul also suffers from presenting players with what are often options that resolve down to self-harm. You can’t pass your turn. You need to take tiles and sometimes you will have nowhere you can place them. Sometimes you have nowhere to place them because someone willingly took a penalty to make sure that you couldn’t. Being forced to take an action that inflicts a penalty always feels worse than a penalty that is applied without the pantomime of your consent. Score disparities in Azul can be significant because of the negative points players can pick up. It’s only rare that players intentionally pick up a penalty (grabbing the first player token asides) – most often it’s because you’ve been left with no alternative as a result of the choices of other players. When it is intentional it is always going to be in an attempt to widen the score disparity. The choice of tiles you leave for another player is a crowbar you put between your score markers. The more players there are, the more you’ll see that happening – maybe not to you, but to others. There’s nothing in the game that incentivises ganging up but there’s a lot of splash damage because of the shared board patterns you’re all working with. You’re all equally interested in all the tiles. Once you’ve placed a tile in Azul, it’s there for good. That’s not necessarily a problem in the same way it is for Sagrada – it could only ever have gone there in a row or column anyway. However, it does mean if you placed one tile away from the clusters on the rest of the board it’s going to have consequences for your scoring for the entire game. Placing a tile in a corner away from everything else means that you’ll lose a lot of opportunities for high value placements. We’re not going to recommend Azul in this category – it’s just too mean in its mechanisms and too gleeful in the malice it encourages. That’s part of what makes it such a very good game, but it’s also part of what makes it a problem for players impacted by issues discussed here. 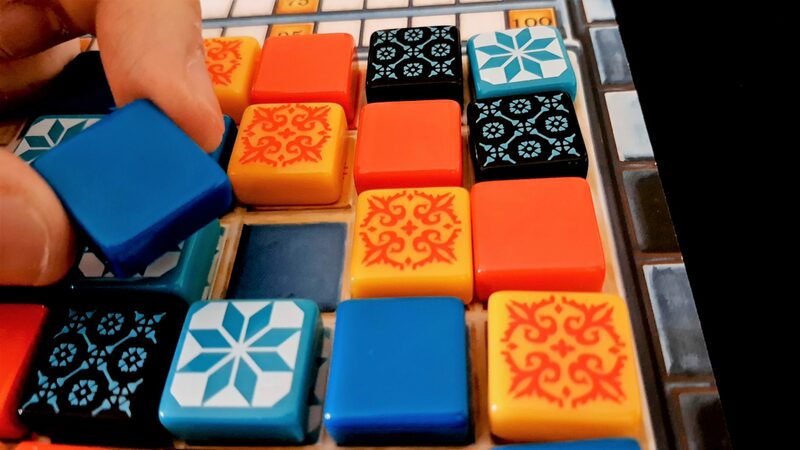 The tiles in Azul are a joy to interact with – heavy and solid and nice to touch. A not insignificant amount of the appeal of the game is to be found in its tactility. I don’t think Azul would have exploded into the scene in the same way if it had used cardboard tokens. However, these tiles add in a few accessibility issues. The first is that they are easily dislodged from the board. A rouge movement can send your entire wall into disarray like the Incredible Hulk just threw Loki into its tiles. The good news there is that because the wall pattern is fixed it’s easily repaired. It’ll never be quite as straight as you’d like though because of how restricted the spaces are. Similarly, when the board gets busy it becomes it increasingly difficult to place tiles in the dense knots that are most likely to yield the largest scoring opportunities. The attempt to do so can knock everything else out of alignment. The same issue exists for score (marked by a cube) – it’s easily dislodged and if that’s going to be a problem everyone is just going to have to be happy with you saying ‘Oh, I had this many points’. The spaces for the score are small and if you’re not very precise with placement you might find yourself mistakenly awarding or docking yourself twenty points at a time. It’s very easy for your cube to jump rows and columns. That said, you could easily use graph paper to make your own ‘accessible’ big version of Azul because the board only presents a pattern for you to fill. There’s nothing to say it couldn’t be filled ‘off board’. You could even do it directly on the table if people don’t mind cross referencing with the pattern where necessary. That way you can have as much space as you like. In any case, verbalisation is trivial because all you really need to do is pick a factory display and a colour (I’ll have the liquorish ones from display two) and then say which row they’re going in. Everything else proceeds with deterministic reliability. Players will need to come up with a convention for which factory display is which number, but any system would work. ‘The display at two o’clock’, for example. So, while Azul does present a number of physical accessibility issues they can be reasonably easily resolved. We’ll recommend it in this category. There’s no need for communication, and there’s no formal need for literacy during play. You can play in sullen, angry silence if you like. And, after a taking a forced penalty, you probably will. We strongly recommend Azul in this category. There’s no gendered art in the game, and the manual is in the second person perspective. As an almost entirely abstract game, there isn’t anything to complain about here. It’s very approachable. It’s simple enough for beginners and deep enough for experienced players. It plays relatively quickly, fitting in well within even busy days. It supports two to four players. It works well at all player counts. This is likely to be a game you play many, many times. Azul is one of those games that I imagine getting very regular usage in any game library. It strikes me as one of those rare universally applicable games – while it won’t scale up to larger families, it is something that fits into a lot of scenarios including play with otherwise game averse relatives. There’s no heavy burden of rules, and an instant appeal that comes from working with such distinctive components. Plus, you don’t really wonder where the money went – it went on those lovely clickety-clacketty tiles. We’ll recommend Azul in this category. Visual accessibility issues paired with memory issues are going to turn both of those recommendations into the opposite. The compensation for not being able to see the board is being able to remember the game state. That’s not going to be possible if there are short or long-term memory impairments that must be taken into account. We’d be a good deal more tentative in our recommendation if visual impairments were paired with colour blindness since a major channel of information would be lost. For those for whom there is an intersection of physical and communication impairments, the game remains playable with simpler communication regimes. It’s possible to fully express choice and intention through exhaustive iteration and indicated assent. This is usually a problem intersection for games, but it’s not a problem here. Games of Azul are reasonably brisk – about thirty to forty minutes in most cases. The game doesn’t support players dropping in and out though because the number of factory displays has to change with player count. While you could start the next round with a smaller number of displays, that’s going to have a considerable impact on the balance of probabilities and will disproportionally benefit those that got lucky early on. Still, the game is short enough that it’s unlikely in and of itself to exacerbate physical or emotional distress. Azul performed better than might have been expected given the nature of the game – it’s not likely to be a game that you want to play if someone has emotional control considerations, and the complexity of the decision space makes it hard to recommend for those with fluid intelligence impairments. For everyone else though… it’s a fairly strong performance. There is a giant version of Azul that I see floating around on social media, but much like Colt Express this seems to be a game that is primarily for convention and promotional purposes. It is twice the size of the standard game and expensive enough to make me splutter with indignation in the attempt to state the price. It would probably be sufficient to nudge the visual accessibility and physical categories into even more favourable grades. If you get a chance to play it, give it a go and report back! $300 though is a ludicrous amount of money to spend on slightly improved accessibility. We love Azul – fierce, feisty and full of heart. It got four-and-a-half-stars in our review and earned what is likely a permanent position on our game shelves. It’s also something that we suspect many people will be able to play. If you’re among them, we don’t think you’ll be disappointed. There is no disappointment. Only Azul.